One of the nicest things about visiting old Grateful Dead concerts that don’t necessarily top everyone’s top 5 list is that you can sometimes be overwhelmingly surprised by what you find. Part of the fun of tape trading was combing through people’s lists looking for things that you didn’t see everywhere else. Then, you might pull out your ragged print copy of Deadbase and flip to one of these shows to see what was played on such a date that had not made it into more heavy circulation. I remember following just this course of action when I first stumbled across 06/26/73 Seattle. I’d never really thought about the show before running into it on a list somewhere, appearing to be in above average sound quality. He’s Gone>Truckin’>Other One>Bobby McGee>Other One>Sugar Magnolia. Hmmm. That looks interesting. This was before I’d come to figure out that my greatest pleasure of all would come from the 1973 Summer shows in particular. I went for this trade based solely on the set list, it being 1973, and it being something I had never heard of before. I have little doubt that it was after hearing this Other One that I set about scooping up every show I didn’t already have in both directions from this date, realizing that there was something I was hearing in June 1973 that I didn’t hear in other parts of the year. I couldn’t put my finger on it, but I knew I was losing myself entirely in these set two jams. Time was dropping away. Mental chatter was silenced. My heartstrings were strummed. I needed more! I had to find everything the Dead did that could do this to me. As it turned out, this window of Grateful Dead music opens on the 06/09/73 show and closes on 09/11/73. Everything in between seems to be drawing itself to the same musical bliss point. For me. What seems unique about these Summer shows is that they exhibit a unique cadence to the jams that is built around the jazzier improvisation style of the year. In part due to Billy’s particular drumming style, a less aggressive push to Phil’s playing, Jerry’s soaring bird-like dance of notes that would arch, dip, and change directions so nimbly, Keith actually taking more of a front seat on the Fender Rhodes, something gelled by the Summer of ’73 that had been forming in the months prior. Also, while the band would definitely slip completely into Space, full of exploding stars, time swallowing black holes, and brain bending vortexes, they did it without coming across as if it were a necessary part of the set. These explorations into Space felt more organic and un-pushed. While chaotic, they are somewhat less dissonant, as if the band's interest in pure noise/tone art (Phil & Ned’s Seastones of 1974) had not quite taken hold. This is a purely personal preference, but I found the mid 1973 Spaces more enjoyable than the late 1973 versions for these reasons. 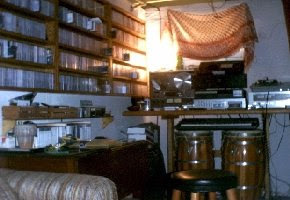 For me, it’s 06/26/73 that pops to my mind when I contemplate the rational answer to the obvious question from non-collectors: “Why on earth do you need to hear every version of these songs?” It might have been just after hearing this tape that I set about hand building my own hardwood tape shelves (pictured above), knowing I needed to make more space for tapes, and pronto. I needed to get every Other One (let alone, Dark Star) from 1973 because there might be more that do this same magical thing to me, in a slightly different way. Don’t you get it, person outside of the Dead tape collecting world?! Well, we know they don’t get it. I'm not really trying to justify the logic of having to collect hundreds (let alone thousands) of shows. I know that obsession is saved for a pretty slim sliver of society. I've simply come to find that my musical quest held something more to its yearnings than just hearing more Dead music. For whatever reason, the Dead's music was a vehicle into a more spiritual level of satisfaction. You can't deny the parallels between the way the band's music could induce rapt attention into the present moment/experience, and the nature of a spiritual goal. As my mind has become more in tune with the path of awakening on many levels, it is clear that this band's music was a powerful step to my getting in touch with my own gold ring, deep inside. It is that power within the music that expressed itself in my unquenchable need for more of it. Each show, it seems, as another chapter in the book of the Dead, could be just that, and more. One man gathers what another man spills. As for my affection towards the Summer of 1973 over other parts of the year, it should be understood that I am in a serious minority. Oh, most Deadheads will chime in that all of 1973 is fantastic. But when you get some really geeky collectors in a room (virtual or otherwise) to dissect 1973 tour by tour, and show by show, you’ll find people polarizing to the front and back of the year more often than not. That’s okay. If you haven’t noticed that I’ve been on a mission to turn you on to the wonders of audience recordings thus far, you’ll never figure out that I’m aiming to turn you on to my particular passion of Summer ‘73 too. I’m stacking the deck for myself, I know. If your following this blog you might well trust my judgment by now, and with that I can get you to sit down and give these kinds of shows a try, knowing that the beauty within will carry through. Now that you got us addicted I expect you get us COMPLETELY through 'this window of Grateful Dead music [that] opens on the 06/09/73 show and closes on 09/11/73'. Please do not skip any of them! Having come to the party a bit late, I felt lost picking shows to download... needless to say this is a grate resource, and the fantastic writing and photos make it so enjoyable. Also, you've thoroughly converted me to auds; I used to like the clarity of sbds, but now I'll take the feel of a good aud any day. It's always a delight to see a new post from you. Thank you very much for the work you've been doing here. Chris, Thanks for your comments. It's always good to know the blog is serving its desired purpose, including the somewhat understated goal of converting folks to AUDs. I'm glad you are getting good stuff out of it. IH, I'll keep coming back to the window over time, I'm sure. Thanks for pointing me towards the Seattle aud. I've enjoyed the sbd since I saw it listed on Jeff Tiedrich's old list of top 25 shows, but it's always good to dust it off and revisit. Your comments about summer 73 space are absolutely right on. I'd never put my finger on it before, but the "more organic and un-pushed" feel of these jams really do bring much more variety to the music; not that I don't love every note of 74, but sometimes it does feel like the "space" portions of many evenings are going through the motions to some extent. But compare 6/26/73 to the Other One spaces of 6/22 and 6/29 (another one I just love) and it's three very different journeys. Ditto with some of the March jams as well. Anyways: well put, as always. Thanks for verbalizing thoughts and feelings that I'm sure are shared by many, many heads! I've been collecting Dead shows for nearly 15 years and yet I never cease to be amazed at how many riches I continue to discover, thanks in part to a blog like this one. Thank you for providing these excellent signposts to new spaces! This is just a perfect description of how it works. Losing yourself in the jam. Time dropping away. Needing more from a particular period in time. Why I need to hear every version of these songs ... to get the same trip in a different way. And no, the logic can't be justified or even explained in a very rational way. As the saying goes, "It's all about how it makes you FEEL." The periods that really light me up are different than yours (early-mid 1968, mid-late 1970, late 1971 to mid-1972), at least for now, and that's just fine. I can enjoy 1973 and other years too & you are helping me keep an open mind. And I am hearing the great advantages of AUDs better with your help ('tho I often still prefer the intimacy and clarity of SBDs). As usual, your writing is intelligent and descriptive to the point where a reader simply has to put on the show you are making comment about. Will certainly do this for 6-26-73, but other than 7-1-73, Summer '73 doesn't resonate as strongly for me, like Urbana and Fall '73 do. However, since The Dead always bear repeated listens, I'll make a point of revisiting some June and July shows over the next few weeks. Time spent listening to The Other One, is always its own reward. Italian Head, Urban might chime in, but it's an easy answer as far as I'm concerned: 2/22/73 Urbana 2/22/73 Urbana 2/22/73 Urbana. I'll get around to telling my story about that tape eventually. Amazing first set. Italian Head, to talk of '73 could be a blog all by itself. Like Noah, I count myself as a promoter that Urbana 2-21-73 & 2-22-73 shows are in the must-listen-to category. He has been able to explain, thru his reviews, what my enthusiastic "Get This Show" fails to relay. I know you post on DNC, so as far as other '73, you should go to the Great 70's folder and search back to Post#13241, Post # 13277 and go forwards and backwards in the Sept. 2007 time-frame. There was a very fun straw-poll of 5-Top Shows, year by year. I could email you the summary, if you need it, but reading thru the postings is a lot of fun. great specific hints. I definitvely go to DNC and check it out myself. The last paragraph: that 6/30/73 aud was all it took for me, on all counts - AUD shows (not that I wasn't already inclined), summer '73, ~1973~, and this web site. I'll follow your old trails anywhere.